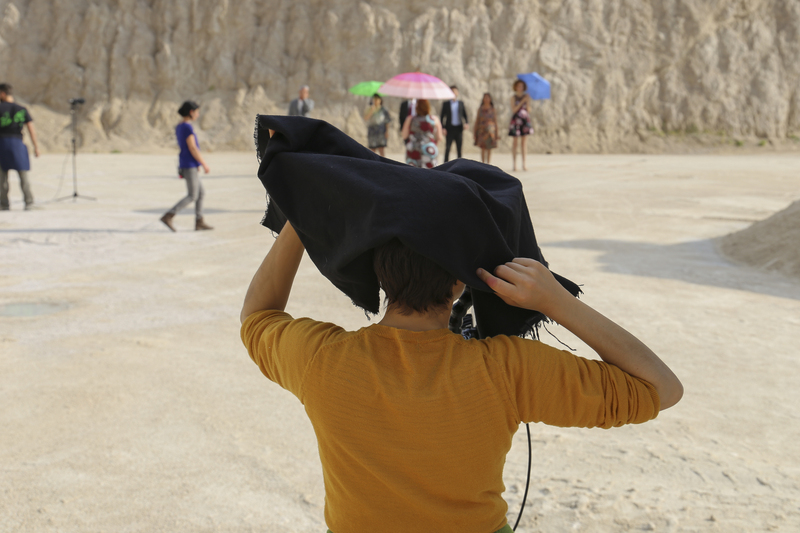 In 2015 Meritxell Campos Olivé started working on her first feature film as a director which was finished in 2017. “Santa Inocencia” was shot in Alvito, nearby Rome. The art film, produced by Dieter Meier and Peter Rommel, investigates in the spirit of the absurd the neurosis and fears of the everyday life, it’s constant projections into the past or the future and the inability to experience the present. “Santa Inocencia” will be shown at several film festivals in 2018. 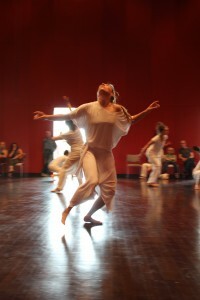 Students of Seneca Intensiv (Berlin) perform a choreography by Meritxell Campos Olivé as part of their final exam. 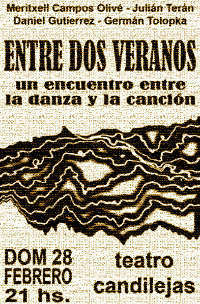 Seven songs by Dieter Meier interpreted in improvised one-take videos by Meritxell Campos Olivé. October 18 – 29, 2017, Sant Feliu de Guíxols, Spain. Paté di Vittima is a dance and poetry performance by Meritxell Campos Olivé, Larissa Gulitz, Caro Köther and Davide Minotti. A play of moves and words, in which the joke is on our memories and their maintenance. And the joke is played with the same weapons we handle everyday to fight back the memories: invective, resignation, impersonation, revenge, a slow flow of time (which makes things work out). In these fake pitched-battle scenarios Memory is the cruelest killer and we all are both victims and perpetrators. scenes of the dance theatre project Human Loops on february, 28th, 2015. 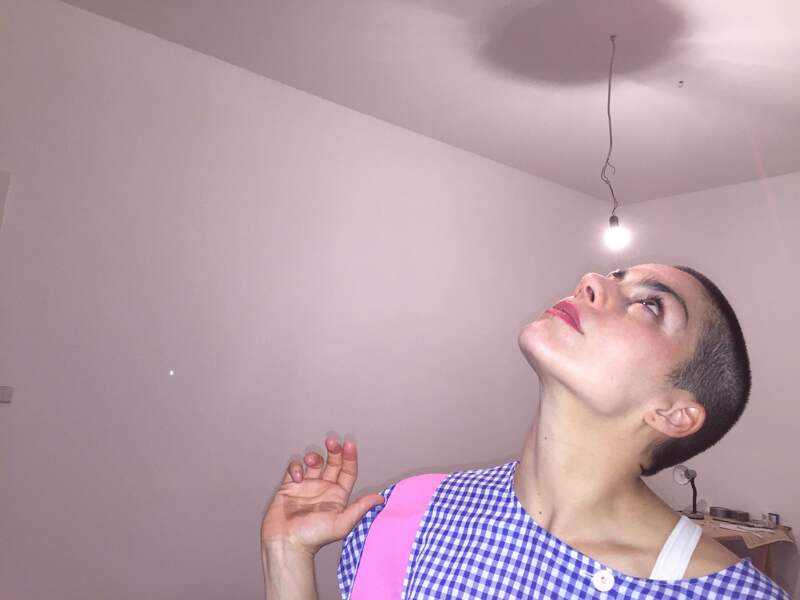 11 – 18 h, performance at 20 h.
Scenes of a dance improvisation. The dance theatre project HUMAN LOOPS of Meritxell Campos Olivé was shown on July 12 and 13, 2014 at the Deutsches Hygiene Museum in Dresden. 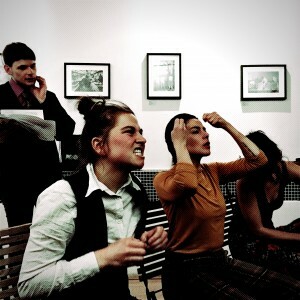 The performance took place within the context of the “Museum Sommernacht” and the “Tanzaustellung”.Within an one week workshop the participants of the project developed their own movements, vocal concepts and “Loops” (choreographic pictures dealing with behavioral patterns of humans and nature). These self-developed choreographies and artistic sequences were presented in front of 1500 spectators. The piece which was premiered on the 7th June 2013 in the Deutsche Hygiene-Museum Dresden is the product of an unusual artistic collaboration: The Zeit-columnist, Harald Martenstein, will read texts about men and women, about the perils of everyday life in Germany and yearning for the south. Alongside, the Berlin-based dancer and choreographer Mertixell Campos Olivé dances. 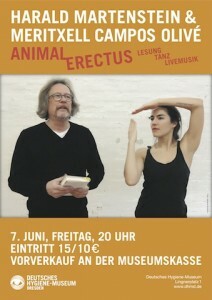 Animal Erectus is accompanied by live music from the saxist Lars Dietrich and drummer Uwe Breunig. On the evening, literature, dance and music will be hardly separable: every form of expression plainly commented or reflected by another. 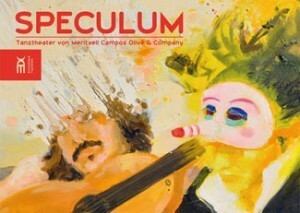 Harald Martenstein and Meritxell Campos Olivé present in this performance their life-affirming attitude and their quirky sense of humour. Harald Martenstein, born 1953 in Mainz, is a columnist for the Zeit, a writer of the Berliner Tagesspiegeland has additionally worked for many years for the magazine Geo. He has published numerous books, including Corine Award winning novel Heimweg (2007) and the novel Gefühlte Nähe. Roman in 23 Paarungen(2010). Most recently, a collection of 34 texts was published under the title, Romantische Nächte im Zoo. Betrachtungen und Geschichten aus einem komischen Land (Aufbau Publishing, Berlin, 2013). Martenstein has also been awarded the Kisch Award, the Theodor Wolff Prize and the Henri Nannen Prize. He is the current holder of the Curt Goetz-ring. He lives in Berlin and in Uckermark. 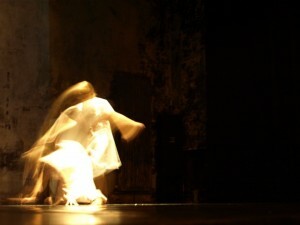 More than 1000 spectators saw the performance of 120 dancers in a unique, highly atmospheric surrounding: the ancient Hospital of Sant Feliu de Guíxols. More pictures under “performances“. In the experimental series “Improvisaciones” the dancer and choreographer Meritxell Campos Olivé shows improvisacions, that evolve from the co-operation with different artists. The choreography as well as the music were created in the moment of the recording. On Thursday, 25.10. at 9pm, Spanish choreographer and dancer Meritxell Campos Olivé Fluxbau, alongside the harpsichordist Daniel Trumbull, will perform their dance/ theatre performance VERTIGO in Fluxbau, Berlin. VERTIGO is like a lifetime in fast-forward: intense, emotional and touching. The 25 minute piece deals with the unexpected challenges, life changes and disasters. 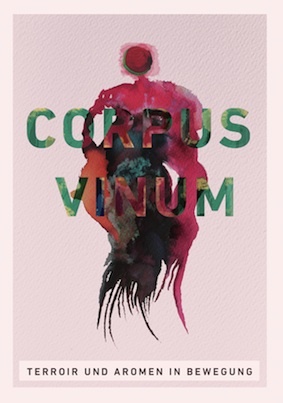 Nevertheless VERTIGO is not a permanent downer, but, like all works of Meritxell Campos Olivé, is colourful, dynamic, and despite all the emotional gravity profoundly life-affirming. These contrasts are also found in the music of the harpsichord Daniel Trumbull, who combines baroque with modern film music. The visual design is created by Georgina Espasa. HUMAN LOOPS is a co-operation between dancers and choir singers from Spain and Germany. HUMAN LOOPS overcomes the seperation between auditorium and stage, like in a living museum the spectators can move freely through the different scenes in the Berlin City Hall. HUMAN LOOPS deals with two formative mechanisms of the human being: dualism and cycle. The performative basis of the respective scenes is the LOOP – little plots and emotional conditions are being performed without beginning or end. Since all scenes are displayed as recurrent loops, there is no specific start of the piece: entrance is possible during the ongoing performance between 20.00 and 20.45 h.
In this performance a fusion between Argentinian folk rock and contemporary dance is created. Light elements and artefacts build the framework of the piece. WHERE: Teatro Candilejas, San Miguel de Monte, Buenos Aires, Argentina. 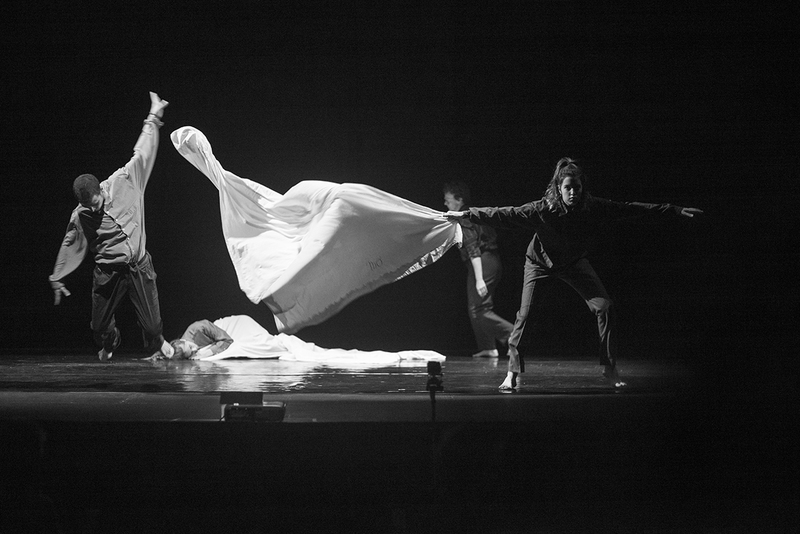 A dance theater piece from Meritxell Campos Olivé (choreography) and Moritz Stumm (director). Using the music from the original soundtrack of “Amores Perros” this work show in 12 scenes the life of the little girl Nemo, who flees from the violent structures within her family in a surreal dream world. 40 dancers from Berlin and Barcelona act in this multimedial piece inspired by the comic “Nemo in Slumberland” . Saturday, 17 October 2009, 8:30 p.m.
Sunday, 18 October 2009, 5:00 p.m. and 8:00 p.m. The group Instant Delay demonstrates in their multi media dance projekt Disonancia Cognitiva the tensions between ideas, alleged certainties and emotions. On the interactive stage a virtual and real life circuit gets closed and unifies the different disciplines dance, video and music.